Sharing another spread for August. I'd actually intended to finish August with this spread but had too many photos to fit. So August will just flow into the next spread. I included a photo I'd taken of Eddy just being adorable sleepy cute on our bed one afternoon. I also added in a scan of a "wanted" poster of Austin we received from daycare. Of course, I had to write about being selected for Stolen Moments' creative team, and Austin's new favorite movie, Garfield. (We had to get the second one for him too, and he just flip flops between them now). 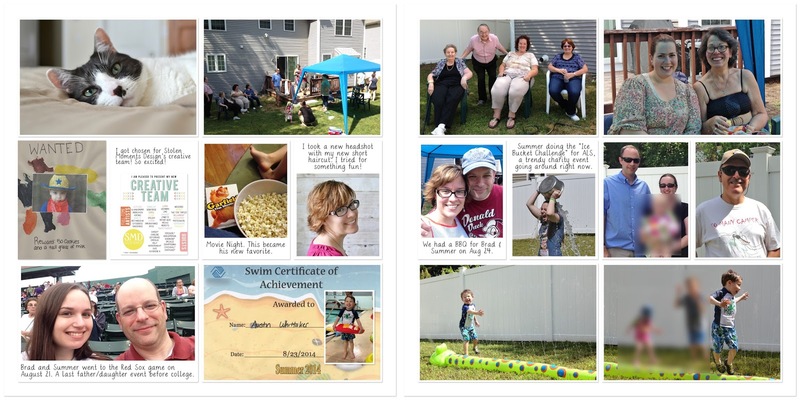 I included his certificate from his first swim class (the second one just started up this month), and a photo from the Red Sox game that Brad and Summer went to. 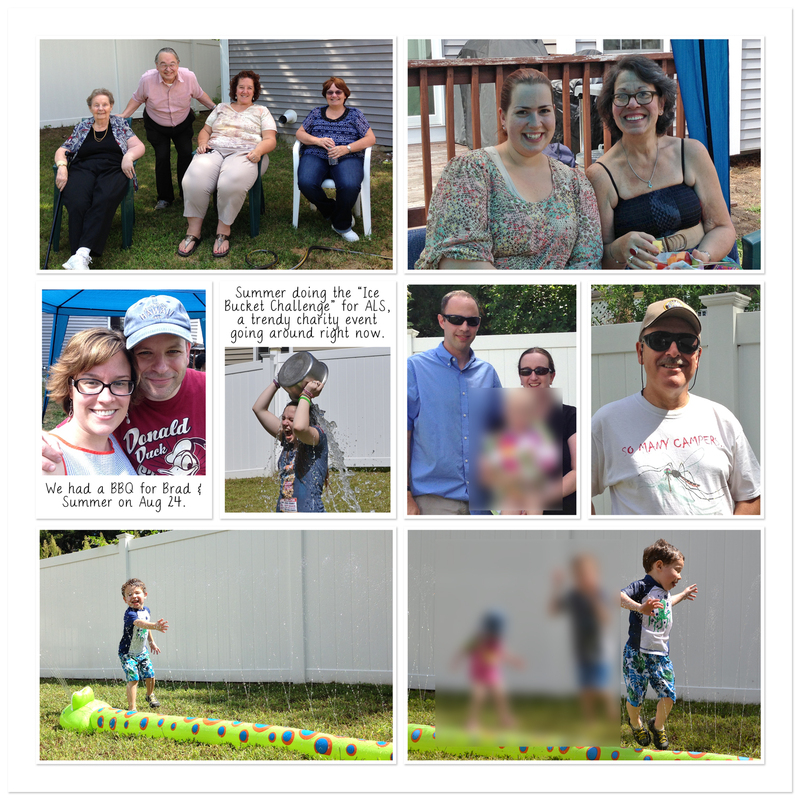 All photos from the BBQ we had on August 24. It was to celebrate Brad & Summer's birthdays, and also as kind of a send off party before Summer headed off to Berklee. 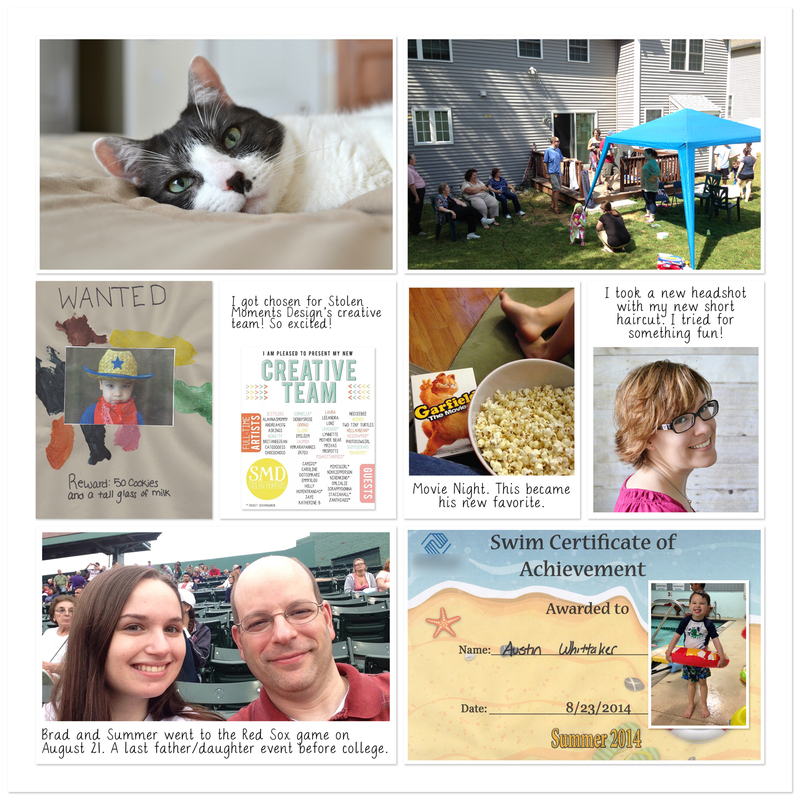 My template is my pocket template 1, and the freebie photo templates I designed. I'm already thinking hard about what to do for 2015. I might to back to that whole creative style I did for the first half of this year, or I might even go back to physical Project Life, in a monthly format. Not sure yet. Right now, the simple style is working so I can just get the memories into my book, but it is a little...plain...for my liking. Any of you thinking 2015 already? What changes are you going to make, if any?